As a volunteer in Peru, you will have the opportunity to make a lasting impact on the community of Huancayo! FIMRC volunteers will work alongside our staff and Peruvian health professionals as well as assist with innovative public health initiatives in local schools and orphanages. Our program is open to volunteers of all ages and educational or professional backgrounds. As our sites are open year-round, volunteers are welcome to travel at any time and for any length of time. We accept volunteers traveling individually as well as groups of various sizes. Spanish proficiency is recommended, but not required by FIMRC. However, volunteers may find that any level of Spanish comprehension will enhance interactions with medical staff, patients, and community members. 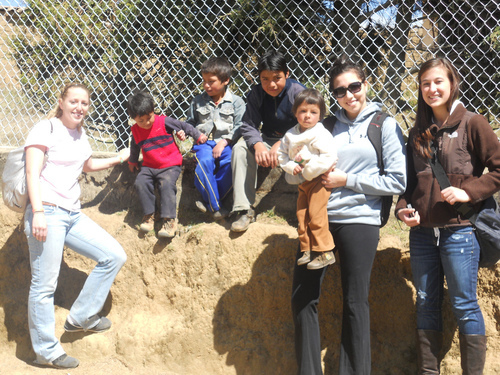 Please note, volunteers traveling up to one week may choose to travel to our project site in Huancayo or La Merced. Volunteers traveling for two weeks or more may opt for an incredible comparative experience, spending time at both Peru project sites. Click here to learn more about the volunteer experience at Project La Merced! Over the course of your trip you'll receive an unfiltered experience in health care field work abroad, and learn about the tremendous impact that even one person can have. At our end, so as to maximize your contribution, we will tailor your experience based on current needs, your interests, training, and amount of time that you spend with us on-site in Huancayo. All volunteers will find a wealth of opportunities to make a difference! You will have the opportunity to participate in both the clinical and health education aspects of operations on-site, and activities can range from conducting rounds with medical professionals to executing a dental campaign with our partner orphanages. 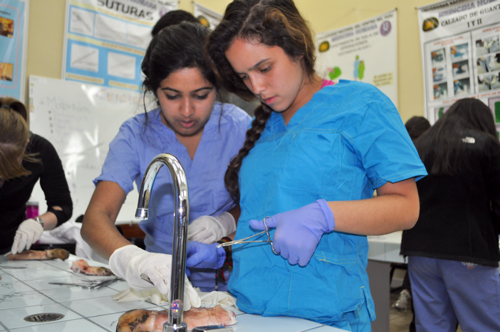 Volunteers in Huancayo perform shadowing rotations alongside Peruvian medical students in large government hospitals and private clinics, attend suturing lessons, and may have the opportunity to observe advanced surgical cases. Huancayo is unique in that volunteers will gain exposure to public hospitals and clinics rather than a FIMRC clinic, offering a glimpse into systems of medicine vastly different from those in the US. Volunteers will also have the opportunity to support orphanages and smaller government clinics on health education initiatives such as leading sessions on proper dental hygiene, hand-washing, and nutrition. Volunteers may also assist staff with vaccination and fluoride treatment campaigns, as well as additional community outreach efforts that address current community needs. There are many opportunities for shaping an itinerary to skills or interests, as our goal is to provide every volunteer a memorable, worthwhile experience that will leave lasting impressions about healthcare in developing communities. The nature of a volunteer mission to Huancayo will vary depending on the number of volunteers in each group, the length of the volunteer trip, respective proficiencies in Spanish, medical expertise, and the current needs of the community and the clinic upon arrival. Please note that a volunteer’s level of training will determine the extent of involvement in medical activities. Your experience varies depending on these factors, but what we can guarantee is that every volunteer mission will be culturally and socially enlightening. 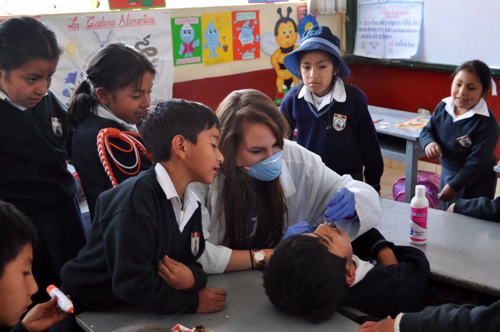 Every volunteer will have opportunities to examine Peru’s systems of medical provision and contribute to ongoing operations at Project Huancayo. The following is a sample itinerary of a one-week volunteer mission with Project Peru - Huancayo. This itinerary has been made to provide a clear, general impression of the way volunteer time is spent. Please note, however, that in order to ensure that a volunteer's work has the greatest, most relevant impact on clinic and community, volunteer schedules are established upon arrival. Volunteers are housed through FIMRC’s Homestay Program. Since the inception of FIMRC’s volunteer program in Huancayo, we have housed volunteers together in a guesthouse-style homestay located within a short drive of the hospital. Homestays all have telephone access and are located within walking distance of internet cafes, making it possible to communicate with friends and family at home. Volunteers are asked to indicate all housing preferences, including meal requests and pet/food allergies in the enrollment forms. The homestay is clean and comfortable with western-style toilets and showers. All transportation is provided by comfortable coach bus or by reputable hired drivers with outstanding safety records. Upon arrival at the Lima airport, volunteers are met by a staff member or representative of FIMRC. Based on flight schedules, volunteers may spend a night in a backpackers’ hostel in Lima after arrival or prior to departure. FIMRC arranges all transportation from Lima to Huancayo, as well as transportation back to the airport at the conclusion of the volunteer mission. Once in Huancayo, we provide van transportation between the homestay and volunteering site(s). Three meals per day are provided at the homestay. Volunteers are responsible for the purchase of meals during any time spent in Lima. All volunteers are responsible for arranging and purchasing their own flights and must fly in and out of Jorge Chavez International Airport in Lima (code LIM). It is the volunteer’s responsibility to arrange all flights in accordance with the dates for which you have registered. If you are traveling with a group, please coordinate with your fellow group members to ensure that you arrive and depart together. Travel time between the airport and project site is approximately 8-9 hours. Volunteers generally stay overnight in Lima on the day of arrival and make the trip to the project site the following day. Upon enrolling as a volunteer, you will receive information on the best day/time to arrive in order to account for this journey and to maximize your time in Huancayo. Accommodations in Lima are covered by the program fee paid to FIMRC.